World Bee Day was declared by the UN General Assembly in December last year to raise awareness of the importance of bees and apicultural products; which is pretty much everything we eat. We believe it will play an important role in protecting bees and the beekeeping sector, in contributing to poverty alleviation and hunger eradication as well as preserving a healthy environment and its biodiversity. 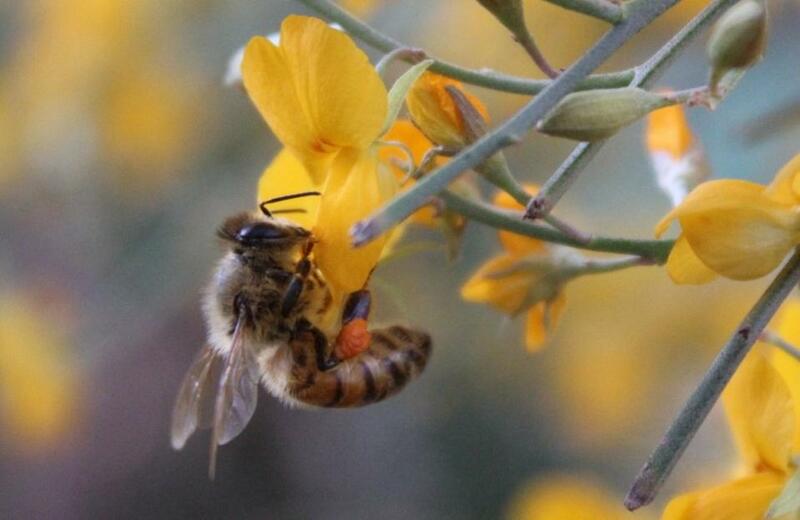 The First World Bee Day will be celebrated around the world on May 20th and in Australia with Canberra hosting some great events which are sure to spread nation wide in coming years. Slovenia proposed the celebration of World Bee Day in the month of May, when bees in the northern hemisphere are most active and begin to reproduce – here such activity takes place during September. Locally Pittwater has hosted numerous Native Bee workshops over the years, some as part of local Community Garden events, while Permaculture Northern Beaches has some great information on local native bees, including information on the stingless variety, Tetragonula carbonaria, which is the only species of social bee native to be found in our area. Visit: www.permaculturenorthernbeaches.org.au/native-bees/ ; and keep and eye out for upcoming workshops. Current PNB ones are listed in the Events page. Stingless bees are found in Sydney, on the eastern side of the Blue Mountains and in coastal areas down to Bega. However, the climate in these areas is marginal for stingless bees, and boxed hives need to be carefully sited and managed. Harvesting honey from hives is not recommended by the Australian Native Bee Research Centre in these areas. The bees will not fly below 18 degrees C and they need the excess honey they collect during summer to survive the long winter months and pollinate your flowers and fruit and vegetable plants in Spring. A list of plants that will attract these to your garden runs below. Also of interest is the Autumn Wild Pollinator Count, the results of which were released on May 13th, 2018. A record 2767 insects were reported, with counts sent in from every state and territory of Australia! An increased 42% of the bees sighted were native species, and butterflies, moths and flies were other frequently-spotted flower visitors. How can you help conserve our native bees? Where can I buy a native bee hive? Native bee hives generally cost between $400 and $500. There is a list of suppliers for Sydney native bee hives on www.aussiebee.com.au. Full details about the designs of boxes for Australian stingless bees and step by step instructions for boxing and splitting hives can be found in the stingless bee publications available on this website. The nest or box should be sited in a warm spot in the garden, preferably with morning sun. The site should also be sheltered from extreme afternoon heat and from cold winds. The bees require flowers for pollen and nectar within about 100 metres of the nest. They will happily use a wide variety of native and introduced flowers. In hot areas, a supply of water near the nest is also desirable. For those who are more familiar with the Apis honeybees, Northern Beaches Beekeepers would be your go to source of how to get involved in ensuring bees here are healthy and prospering. The Northern Beaches Beekeepers Club aims to promote “Responsible Beekeeping through Knowledge” and cater for those thinking of keeping bees through to recently new and experienced beekeepers. They meet on the first Wednesday of the month to provide a forum to discuss various beekeeping issues with occasional talks from experts to help members to keep up with current beekeeping trends, understand and manage disease threats to hives, equipment setup and generally share beekeeping knowledge and experience. NBBC host regular events such as the Northern Beaches Beekeepers Apiary Field Day - Sat 26 May, 2018 at Oxfard Falls or the June 6th NBB monthly meeting - Medicinal Honey at Collaroy. At their June Club meeting, Dr. Lamorna Osborne will talk about the uses of medicinal honey for issues such as wound management, burns (including radiation burns), fungal infections, and various conditions (including MRSA & VMRSA). Dr. Osborne is a partner in a South Sydney group medical practice and has been using medicinal honey for wound management. In cases where antibiotics have been unsuccessful in treating super bugs, Dr. Osborne has found that when using medicinal honey, difficult wounds heal much faster than many nurses and doctors have expected. In addition to her clinical work, Lamorna is the president of the Illawarra Beekeepers Association Inc., a member of the executive board of the NSW Apiarists Association and a former president of the Amateur Beekeepers Association of NSW. This will be followed by a general Q&A session on any other aspect of beekeeping. Event is free for members and $5 for guests, collected at the door. Booking via Eventbrite is essential!!! Details: A Backyard Beekeeping Course with Bruce White OAM will be hosted by Northern Beaches Beekeepers Inc. The course will cover topics such as protective clothing, hive design, hive management, bio-security, honey extraction and a whole lot more in a hand-on practical weekend. This year's course will also have a module on Flow Hive. Australia is home to around 1,500 species of native bees. These tiny pollinators grace the gardens and bushland of Australia and keep it healthy. Our largest native bee is a stocky 24 mm carpenter bee with a glossy black abdomen and a bright yellow furry waistcoat; the smallest species is a minute, almost hairless bee, less than 2 mm long. Most species 8–13 mm long - With bands of opal blue or whitish fur across their black abdomens, blue banded bees love visiting purple flowers such as lavenders. Groups of males are sometimes seen clinging to a grass stem at night. These fat bees, covered with thick light brown fur, nest in shallow burrows in the soil. Many gardeners first discover leafcutter bees when they notice the neat oval or circular pieces that the bees have clipped from the edges of soft leaves. The bees weave these leaf pieces into tiny cells for their young. These charming black bees are Australia’s own native honeybees. They build resinous nests inside hollow trees and store their aromatic honey in tiny pots. Australia’s magnificent native bees make a fascinating study for the garden enthusiast and can also provide a valuable pollination service for the home vegetable garden. Carpenter bees, blue banded bees and teddy bear bees are capable of a special behaviour, called buzz pollination, which is ideal for the flowers of tomatoes, capsicums, eggplants and chilli peppers, as mentioned by PNB. The best known native bees in Australia are the stingless social bees. These are true Australian honeybees with a queen, drones and hundreds of worker bees in each nest. However, their nests and behaviour are quite different from those of the introduced European commercial honeybees. The stingless bees may be seen in the garden on warm days throughout the year. Most Australian native bees, though, are solitary and are only seen in the warmer months from September to March. Each female builds a tiny nest by herself in a burrow in the ground, or in holes in soft timber or twigs. She stocks a tiny cell with nectar and pollen, lays an egg, seals the cell and then abandons it. By autumn most adult solitary bees die. However, the developing young bees live on in their cells, emerging in the next spring to fly amongst the flowers. Solitary native bees can sting but most are too small to give an effective sting and they are not aggressive. Gardeners can choose a wide variety of plants to attract and support native bees. Some plants provide valuable supplies of nectar and pollen for the bees whilst others assist the bees with their nest building. Good food plants for native bees include Angophora and Eucalyptus trees, Brachyscome groundcovers, grevilleas, Leptospermum and Westringia. Leafcutter bees love collecting pieces of soft leaf for nest building from plants such as Senna clavigera, and the slender reed bees build their miniature nests inside dead pithy stems of plants such as tree ferns. Many non-native plants such as the Butterfly Bush (Buddleja davidii), lavenders, roses, salvia and daisies also attract native bees. Resin bees and leafcutter bees like to build nests in deep narrow holes in timber Gardeners can support these bees by providing artificial nest sites for them. A simple bundle of bamboo canes hung in a tree can provide attractive nest sites for these bees. Holes (4 – 9 mm wide and at least 80 mm deep) can also be drilled into a piece of old hardwood timber. Brachyscome: These long-flowering ground covers are popular with stingless bees. 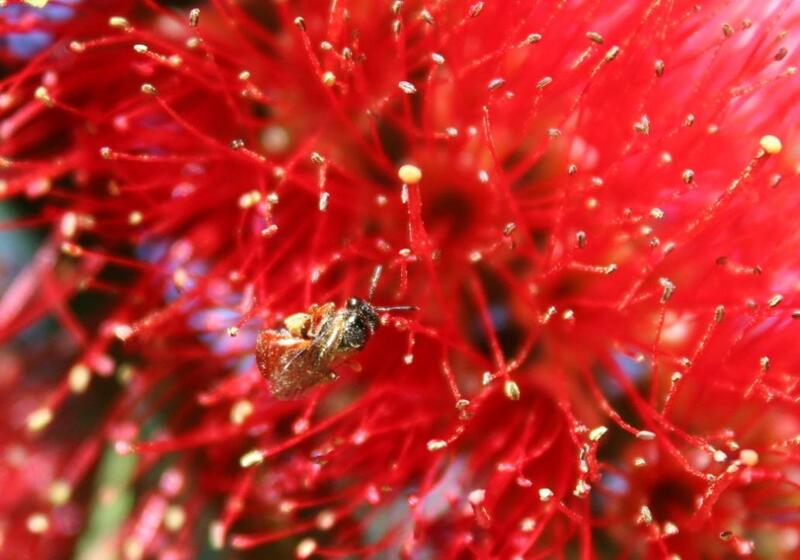 Callistemon – Bottlebrush: These nectar-rich flowers also attract native bees. Ceratopetalum gummiferum ‘Alberys Red’ - Christmas Bush: This large shrub, with dense cream flowers in springtime, attracts many native bees. Grevilleas: Many Grevilleas such as Grevillea Moonlight provide good nectar for bees. Hibbertia scandens: The Common Teddy Bear Bee and the Common Blue Banded Bee love buzzing the flowers of Hibbertia scandens. Leptospermum polygalifolium - Lemon Scented Tea Tree: Leptospermum species are in the ‘top ten’ list in Native Bees of the Sydney Region – A Field Guide. Scaevola humilis - Fan Flower: Many small native bees and leafcutters visit these flowers. Senna clavigera: The Common Teddy Bear Bee, the Common Blue Banded Bee and the Emerald Homalictus buzz the flowers of this bush. Leafcutters also clip pieces of the leaves for their nests. Long flowering period. Thryptomene saxicola FC Payne: This graceful winter flowering shrub attracts stingless bees and other native bees. Westringia fruticosa - Coast Rosemary: Westringia is also in the ‘top ten’ list in Native Bees of the Sydney Region – A Field Guide. It flowers over a long period and is tough and reliable. 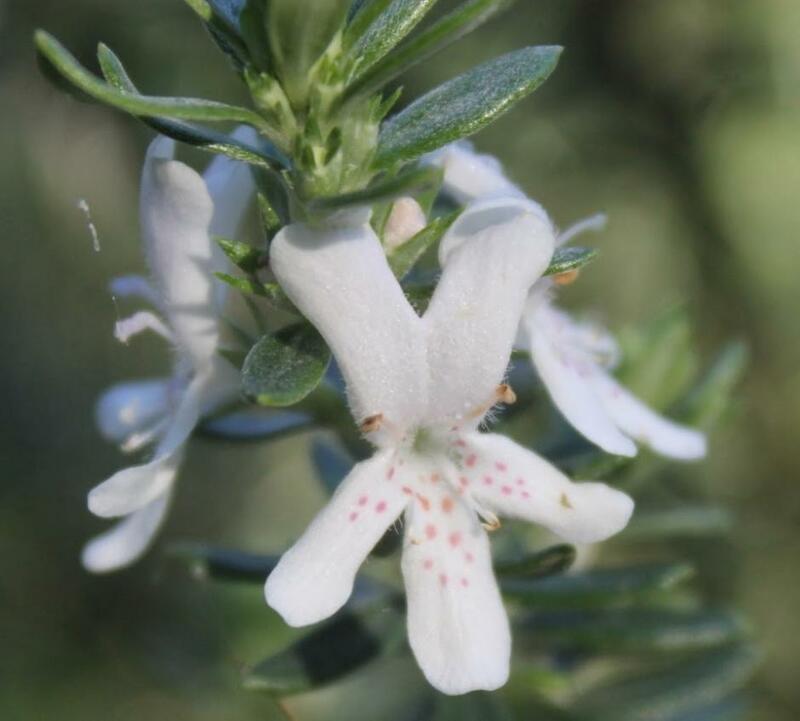 Coastal or Native Rosemary (Westringia fruticosa) - photo by A J Guesdon. On December 20th, 2017, the United Nations General Assembly adopted by consensus a resolution declaring 20 May as World Bee Day. Every year on this day, the attention of the global public will be drawn to the importance of preserving bees and other pollinators. People will be reminded of the importance of bees for the entire humanity and invited to take concrete action to preserve and protect them. The resolution was co-sponsored by 115 UN Member States, including the USA, Canada, China, the Russian Federation, India, Brazil, Argentina, Australia and all the European Union Member States. "After three years of efforts both in terms of the official procedures at the UN and with regard to the intensive process of informing countries around the world, we have succeeded with this initiative. Bees and other pollinators finally have the place they deserve in view of their importance for the world and for humanity. The proclamation of World Bee Day proves that the will to take action does exist. I am happy that realisation of the importance of bees for sustainable development and the future of humanity in general has reflected in the consensual support to the resolution." "This is just the beginning of the difficult process of the protection of bees and other pollinators. In order to be successful, we must bring on board the governments of all countries, the business community and civil society. Awareness of the vital importance of saving the bees must reach every individual. And we must do more than just talk – we must undertake concrete activities to increase care for bees and promote the development of beekeeping – everywhere, including in developing countries." "From today on, 20 May will be a worldwide celebration of bees and beekeepers. I believe that with the proclamation of World Bee Day, the world will begin to think more broadly about bees, in particular in the context of ensuring conditions for their survival, and thus for the survival of the human race." Slovenia proposed the celebration of World Bee Day in the month of May, when bees in the northern hemisphere are most active and begin to reproduce. This is also the period in which the need for pollination is greatest. In the southern hemisphere it is autumn, a time for harvesting bee products and days and weeks of honey. The chosen day, 20 May, is also the birthday of Anton Janša (1734–1773), a pioneer of modern beekeeping and one of the greatest experts in this field in his day. He was the first teacher of modern beekeeping anywhere in the world, appointed by the Empress Maria Theresa as a permanent teacher at the new beekeeping school in Vienna. Studies of United Nations and the International Union for Conservation of Nature show that bee populations and the populations of other pollinators have significantly decreased, making them more and more endangered. This is affected by numerous factors which are the consequence of human activity: intensive agriculture, widespread use of pesticides and pollution caused by waste. Bees are exposed to new diseases and pests. The living environment of bees is shrinking due to the ever-increasing number of the global population. Their survival and development are also threatened by climate change. In addition, agricultural plants which require pollination are an important source of jobs and income for farmers, particularly for small and family farms in developing countries. Last but not least, bees have an important role in the preservation of the ecological balance and biodiversity in nature. Bees as good bioindicators of environmental conditions inform us that something is happening to the environment and that we must take action. Prompt protection of bees and other pollinators will significantly contribute to solving problems with global food supply and eliminating hunger. It will also contribute to efforts to halt further loss of biodiversity and degradation of ecosystems, as well as to the objectives of sustainable development defined in the 2030 Agenda for Sustainable Development. In 2015 these considerations led the Republic of Slovenia, at the initiative of the Slovenian Beekeepers' Association, to begin procedures at the Food and Agriculture Organization of the United Nations (FAO) for the declaration of World Bee Day and to propose a resolution underlining the importance of bees and other pollinators. The initiative has been endorsed by the Conference of the Food and Agriculture Organization of the United Nations at its 40th Session in Rome on 7 July 2017; and the the procedure was successfully concluded today with the consensual adoption of the World Bee Day Resolution by the UN General Assembly. Slovenia is one of the top countries in the world in terms of the number of beekeepers per capita, with every 200th inhabitant a beekeeper. For tens of thousands of Slovenian citizens, beekeeping is a way of life with a long tradition. The bee, in particular the indigenous Carniolan honey bee, is part of Slovenian national identity. Slovenia is the only country in the European Union to have introduced legal protection for its bees. In 2011 it became one of the first countries in the EU to prohibit the use of certain pesticides harmful to bees. Native bee on red bottlebrush - photographed at Newport, Pittwater side, Spring 2016 - A J Guesdon picture.